1. Long straw. Be sure to ask your source is the bales are long straw or chopped/thrashed straw. A bale harvested by a combine will be thrashed straw and the short pieces make for a very weak bale. These are a poor choice for building. A long straw bale will typically be 14″ tall (2-string) and 16″ tall (3 string). 2. Look for a cut edge and a folded edge. If the cut edge is not clearly visible on one SIDE of the bale, it is probably a thrashed bale and the “cut edge” is likely facing up or down. Again, don’t buy these bales. 3. Color. You want a bright, golden color. Brown or black bales have seen moisture damage. Dull bales may have been stored for a season or longer. They can be acceptable if the other details check out; however, fresh bales are best if you can find them. 4. Moisture Content. Bales should be around 8-13% moisture content when checked with a bale probe. Under no circumstances should the bales reach higher than 20%. At that level, mold growth is supported. 5. Density. The easiest test is to pick up a bale by one string. If the bale deforms in any way, then don’t buy the bales. If the bale stays completely in shape, then the density is acceptable. 6. Shape. tight, rectangular bales are what you want. check the corners of the bales to make sure they are not rounded. Rounded corners will mean a lot of stuffing after the wall is stacked. Tight, angular corners mean the bales will fit together well and your stuffing will be limited. 7. Smell. This is another test of moisture. When you walk into the barn, take a deep inhalation through your nose. How does the room smell? Musty is not a good sign. Fresh straw is what you want to smell. 8. Weight. Dry bales will be relatively light weight. A 2-string bale should not wiehg more than say 45lbs. If it’s heavy (you’ll know what heavy means when you feel it) the bale is probably wet. Most importantly, use your common sense. If something seems off, it probably is. The importance of quality bales can’t be stressed enough. If you get bad bales, you will fight them from the moment they arrive on site to the moment you finish the house. They make for more retying, more stuffing, more material loss, more post stacking compression, less effectiveness of wall clean up (string trimmer work), weaker vertical stands and corners, more tamping to get your walls plumb, weaker plaster substrate and more. Trust me, get quality bales. Thanks Chadwick. I appreciate your kind feedback. You say in your blog not to use straw that is harvested with a combine. What’s the alternative? As far as I know, here in South Dakota all farmers harvest their wheat with a combine. So, how do I find bales with the long straw as you are recommending? 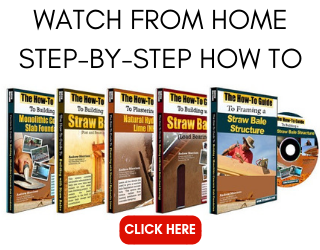 I do love your site and all the ideas you are giving, and I too will build a strawbale structure one of these days. Until then I’ll let your website and blogs inspire me.Thanks! I agree with most of your bullet points except that straw that has been combined won’t work. The key is to get straw that has been combined by a conventional versus a rotary combine. A conventional combine will remove the grain heads and then pass the straw through and out the straw walkers on the back of the machine. A rotary will rotate the grain and straw many times and in the process crush and chop the straw so that it doesn’t bale as well. Hi Monica. Basically what you’re looking for is straw that has not been run through the chopper before it is dropped back onto the ground for baling. If the chopper/shredder is turned off and the straw is allowed to hit the ground after cut and harvest, it will be okay. Traditional, smaller tractors used a sickle mower which cut the stalk low to the ground and allowed it to fall over. straw from these machines is ideal for construction work as it is full stalk length. Hope to keep inspiring you towards building! Thank you Rex. This is the perfect distinction. Clearly I don’t know my machines as well as you do. Thank you for clarifying for everyone. A question to my fellow commentors who have a farming background: This summer I have a neighbours field to take the straw and store for our home project. I have never operated a baling machine before, but I have access to one for this project. Do you have any recommendations or advice to make sure I get top-quality bales. Or, would I be better off getting someone with experience to do the baling and I would simply provide my labour. Also, any advice on setting up and adjusting the machine to get those quality bales with high density and square corners? Thanks for all the support here! In my experience as both a builder and someone who has tried to bale his own straw before, you are best to hire a professional. Adjusting the machine, knowing when to bale so that the straw is not too wet nor too dry, and so many other details go into making great bales. It’s not as easy as you might think. You are better off paying a little for the expert help and getting great bales than doing it yourself and ending up with mediocre, at best, bales. We spoke with an expert over the weekend, who said the same thing! So, the neighbour with the wheat who happens to be the local dealer in farm equipment (does it get any more expert?) will do the baling. We will be gathering the bales and learning the ropes (or twine in this case). We had a long discussion about bale quality also. Something really interesting we learned is the reason why you can pull bales tighter. When bales are originally baled by machine, they are much tighter. The bales shrink over time as they dry and become looser. That is why it is possible to tighten them again by hand. We are told that the bales can be made much tighter if the loose dried bales are broken up and run through the baling machine again. Our required 600 bales could be re-baled in this way in 3-4 hours. Bales simply re-tied by hand would take a whole weekend. However, this will not be necessary if the straw is very nicely dried when baled from the field. I am not sure I would want to re-bale considering alignment of the straws, and the consistent cut and bent edges. Ths could be a detailed discussion point, but probably not a necessary discussion so long as we can achieve top-quality bales to begin with. Thanks for your information and discussions on this website to help ensure success! Alan, your equipment dealer may be the least experienced person to do the baling. In my experience(a whole lifetime on the farm) dealers know how to sell equipment, but not necessarily how to run it the best way possible. Do not rebale the bales! I have not built with straw, but rebaling does not give nice consistent bales. set up the baler right, and wait for it to be fully dry, and drive a little slower if necessary to get more strokes per bale. I would rather wait an extra year to get good straw rather then rebale. How long should straw be from that conventional combine? I have a sample of stuff that was claimed to not be chopped, I’m seeing 3 or 4 inches and it’s not laying uniformly. Is it worth looking for stuff from a sickle mower, and how long should that be? Any suggested sources for around La Grande OR or Lewiston ID? Everything I’m seeing is pretty badly chopped. HI Jerry. That sounds chopped to me. I have straw that runs about 14″ or more. Not sure about resources in that area. I’ll see what I can find out for you and I’ll post whatever I find…if anything. How about the best time of year to buy? I’m in N.CA. Looking at rice and thinking they have two harvests each year(?) one late spring? One fall? Am I on track? I have to admit that I am not the guy to ask about regional harvests. Your timing sounds right to me based on what I see in my area. It is okay to store the straw for a full year too, as long as it is well protected (in a barn is best). Wondering how important the stuffing is before plastering? How densely do you need to stuff? By hand or with a stick? I encourage people to stuff as tightly as possible. The more stuffing you use, the tighter your wall will be in terms of energy efficiency. Further, the less plaster you will use on the wall. I live in La Mesa, CA and am looking for straw bales to purchase. Do you have any for sale in my area or do you deliver to my area? I am a disabled American Veteran, a widow, and I have two disabled children. I want to us the straw bales in my garden so I may grow plants in them. I saw a straw bale gardening video on web and would very much like to try it for my family. Hi Janice. Thank you for your service. The best thing may be to contact a local farm supply store or co-op. You are talking about just a few bales, so that is likely the best route to take. Farmers will deliver as well, but only in much larger quantities (typically). 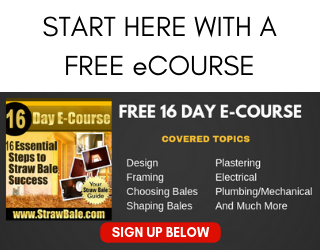 If you continue to struggle to find a source for your bales, please try contacting the folks at CASBA as they will surely have better local connections than I do as they are the California Straw Builders Association. Can you use hay bales instead of straw bales? The hay consisting of fescue or brome. I would not use hay. 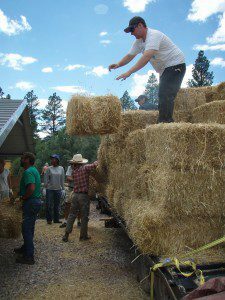 Hay is a food source and has a higher moisture content than straw. 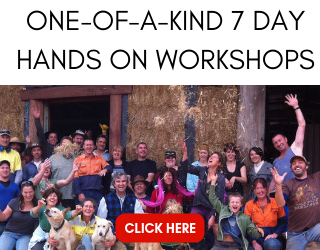 Hay bale houses have failed over the years where straw bale houses have been successful. Thank you for this information. I’m considering using pine straw for mulch in my gardens. I’m in an HOA and they use recycled water. I’m in Tampa Bay so the salinity is strong. I’m hoping the straw will help counter with its acidity. The source is a building supply business in St. Petersburg, FL, and they advertise their pine straw is 100% sustainable.